Most people do not expect to become disabled, but the fact is, the chance of becoming disabled at some point in your life is 1 in 5, according to the U.S. Census Bureau. For people who need to work to put food on the table, a disability can mean serious trouble. Thankfully, long term disability benefits are available to individuals who suffer from sudden illness or injury. If you or someone you love is suffering from a disability that prevents them from working, the Indiana long term disability benefits attorneys of Hankey Law Office can help. Our dedicated and compassionate attorneys have years of experience helping people get the benefits they need. Contact us today at (800) 520-3633. Long term disability benefits can help those who develop disabling conditions meet their day to day financial needs as they seek treatment for a disability. Dealing with a disability is never easy, and the process of applying for and receiving benefits can be challenging. If you are dealing with a disability that prevents you from maintaining gainful employment, contact us today at (800) 520-3633. 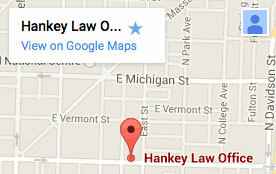 The Indiana long term disability benefits attorneys of Hankey Law Office can help you get the benefits you need.